LATU Uruguay Buying 100,000 OLPC XO's Over Classmate PC!! We now have the results from the first open competition for government purchases of laptops designed for 1:1 implementation in public schools, the Ceibal Uruguay RFP. LATU Uruguay, the government entity testing both Intel's Classmate PC and One Laptop Per Child's XO computer has rated the XO-1 the better option for the children of Uruguay's Florida province, 56.84 points to 53.06 points. Now the findings are not official yet, as all the bidders have five days to contest the process, but this is a stunning upset for Intel and a resounding confirmation for OLPC. LATU will be purchasing 100,000 laptops for children, with an option to buy 50,000 more, at $199 per laptop. Brightstar [Uruguay with OLPC XO's] began the process by offering their computer at US$205; Positivo at US$ 274 (in their open-source Linux offering) although this unit had more memory and functionality. Latu negotiated on price, and finally the OX went down to US$199 and Intel's unit to US$258. Grupo Positivo's [of Brazil with Intel Classmate] proposal, which included servers, connectivity, teacher training and educational portals, also had a proposal for use of Windows and tech support in Uruguay by the Sonda company. Brightstar's offer only includes teacher training and tech support, in addition to an additional 1% supply of machines for replacement purposes due to wear and tear. In addition, this design allows for parts that can be replaced by the children themselves. Congratulations One Laptop Per Child! And congratulations Brightstar Corporation. Their $2 million USD donation to OLPC has paid off handsomely. 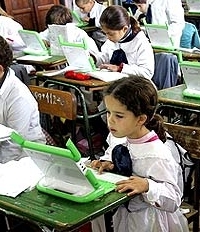 OLPC Uruguay: Request for Ceibal Proposals Out! How about OLPC XO and Classmate PC? i wus wondrin if u culd be abl to dwnlood or read maybe serch othr xo's scandisks. i thnk it wuld be relly cool. i culd have a sd of books and my neighbor has savd websites. So AFAIK this is the first *country* committing to actually going ahead and purchasing X0s, right? Why the * * ChristophD ? Do you think uruguay doesn't count as a real country because it has small budget and small population? Well that's the kind of country I expect to be an early adopter of anything. Uruguay has 3 million habitants which is less than many big cities. I stand on my argument that municipal powers are more likely to help OLPC than big national spheres of large countries. Or maybe you expected that china would rush to buy one billion laptops before anyone else. Alexandre, I interpret Christoph using the * around *country* meaning to differentiate between different purchasers of the XO, not doubting if Uruguay is indeed a country. If you look at the list of entities that have put up their hand to buy XOs we have Billionaire industrialists, non-profit organisations, ordinary citizens getting the 2 for 1 deal and trial schools under government management. Uruguay is also probably one of the least likely places to take the XO considering their 3 million population. Less people = smaller budgets. "Alexandre, I interpret Christoph using the * around *country* meaning to differentiate between different purchasers of the XO, not doubting if Uruguay is indeed a country." Also, Uruguay is NOT buying XOs for ALL its children. Just for 100,000. In that way it too is not a complete country buying XOs. Robert, you're spot on with your observation, I wanted to differentiate between the different buyer categories, emphasizing that Uruguay was the first country to actually go out and purchase a significant amount of units. Sorry Alexander for the confusion! How many children are enrolled in schools in Uruguay, does anyone happen to know? Because while Winter is right about the 100K not being enough for ALL school children, 100K in a 3 million country will have a significantly bigger impact then let's say 250K in a 30 million country. If we believe the population spread is linear from newborn to sixty years of age then 1 years population is 1.6% of the total population. If Wikipedia quotes the 2002 census correctly at 3.4 million people then 1.6% of 3,400,000 is 54,400 (per year). So 100,000 laptops would supply 2 years worth of students. and click on the "Extract data..." button. according to the data the population in 0-4 and 5-9 age ranges was 275 k and 270 k respectively in 2000. so a better estimate would be some 67 k children in one year. which means 100 k laptops are still more than one year worth. "This means giving computers to all [Uruguay's Florida province] kids and teachers, as well as providing connectivity infrastructure in all its schools and in as many homes as possible. I don't have the exact numbers now, but we are talking about more than 100 schools (many of them called "rural", with only one classroom and one teacher), about 500 teachers and 10,000 kids. The total population of Florida is close to 70,000, half of whom live in the capital city Florida, most of the rest live in smaller cities, and 12,000 live in rural areas." While there's no formal announcement yet, Peru's Finance minister said in an interview yesterday that next year's budget includes funding for acquisition of 20.000 computers a month for schoolchildren and a fund for co-financing acquisition of computers by teachers. No more details yet. So this makes Peru the second country to commit in Latin America. As soon as I have details about the implementation plan, I'll post them here. The process has not been even close to CEIBAL in Uruguay, with no clear selection policies and a less than transparent conduct by the ministry. I have understood that my country, Romania, has already ordered some also. "I have understood that my country, Romania, has already ordered some also." But I remember that a year or so ago, the Rumania officially decided that the OLPC was not good enough. Some Microsoft CEO (Gates or Balmer) just visited to mark the event. According to the BBC today the President of Uruguay sacked four ministers including the Min. of Education. I wonder if that will affect the project. I'd like to clarify that Uruguay is ordering 200K more laptops to complete the plan. It is estimated that in 2009 every child of any public school will have its own laptop. This is particularly important in rural areas, where children perhaps wouldn't touch a laptop (or any computer) in their lifetimes. The goal is to reduce the breach between poor and rich, which is the main issue in Latin America (among other issues). Knowing how to interact with a computer will be in a very short time (if it is not already) like knowing how to read and write. Hello, I am uruguayan, and I am informed about all this plan... ower Country is very small... This lasts years the uruguayan people have been governed by a left President, this mean, the goverment is very intresting in the people. We have a education sistem that allows all the people get education (although the last 20 years the level has lowered), the education is totaly free since de promary school until the University. For example I had asist all my childhood to public school, public school doesn't mean poor education.